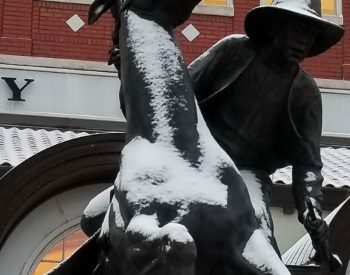 A snow-covered statue of a horse and rider at dusk in front of City Hall Monday gives a reminder of a glum night on the prairie during the Cherokee Strip Land Run 125 years ago. The Centennial Statue anchors the plaza and commemorates the historic land run into Oklahoma Territory on Sept. 16, 1893. The late Jo Saylors created this masterpiece, which was a gift to Ponca City through donations from citizens.